My friend Jim Vincent had seem my earlier images of Andromeda and with my 8" Newtonian the field of view was quite narrow and therefore could not fit in the whole of the Galaxy so he kindly offered to lend me one of his scopes, an Orion ED80 which is widely regarded as a great imaging scope. 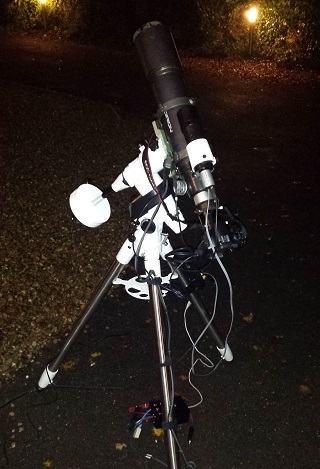 I didn't have to wait long for an opportunity to use the scope as on the 2nd October there were clear skies. I set up the scope on my EQ5 GoTo mount and used my SkyWatcher 9x50 finder scope with my QHY5L-II guide camera to guide the mount with PHD. 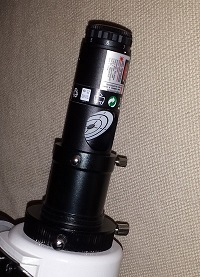 Jim had also mentioned a cheap piece of Astro imaging software to try known as APT ("Astro Photography Tool") so i downloaded the trial, i will purchase shortly at 12.70 EUR (£9.97 GBP) as it works with other ASCOM compatible astro software including PHY (Auto Guiding). I used ATP with my EOS so make some custom shooting plans this way the setup could be left out while the plan runs, however tonight had only an hours worth of unmanned shooting so i stayed with it. The next night happened to be clear as well even though it had been raining on and off during the day. Again i setup the scope early and had a little look around the sky while i waited for Andromeda to rise above the trees on my drive. 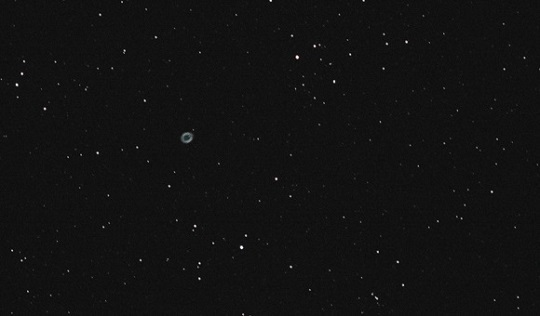 Below is an image i managed to capture of M57 the ring nebula. 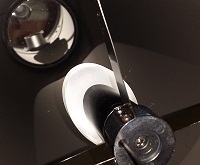 After a while i started to lose guide stars from PHD and i couldn't work out why as the sky was clear and i couldn't see any clouds, then i looked at the front of the guide scope and noticed some dew gathering. I carefully wiped it off and made up a little cardboard dew shield that actually worked quite well, i also checked the ED80 which was clear - it has a bit of a built in dew shield so it must be doing the job. 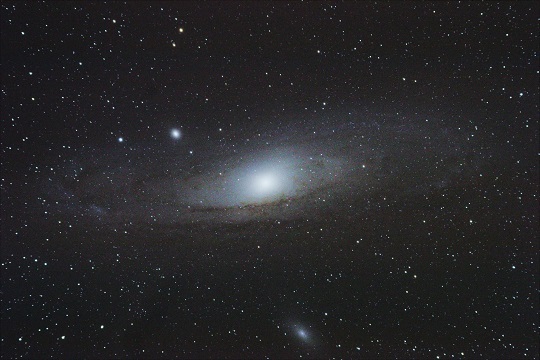 Once Andromeda had risen over the trees i setup a 3hr shooting plan (plus darks and lights) in ATP shut the garage door and went inside for a while. 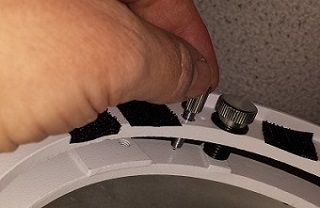 I periodically checked the shooting plan and the scope, after about 2 hours ATP had lost communication to the camera as the EOS battery had run out, i replaced the battery and continued shooting. 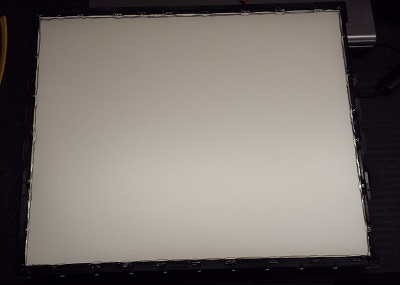 After shooting the 'lights' i turned the scope to the garage door, covered the lens with a white T-Shirt and took 25 'flats'. By now it was about 2am so i moved the scope into the garage, covered the lens so it could shoot the 'darks' while i went to bed. With great expectation the next morning i transferred the images off of my laptop to my PC for processing. Sadly the expectation was short lived and the dew issues i had with the finder scope had also affected the ED80 and most of the images were unusable so i didn't bother processing - we live and learn - maybe I'll try and salvage them later. 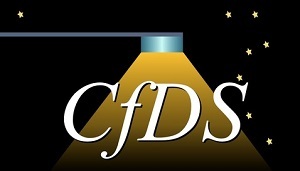 The Campaign for Dark Skies (CfDS) is the United Kingdom's largest anti-light-pollution campaign group forming part of the international dark-sky movement and it is run by the British Astronomical Association. As mentioned at the end of my last blog i ordered some new toys, as yet i haven't used the Telrad but i am really pleased with the binoculars especially for the price. So i have decided to add a reviews section to the site which will be coming soon. 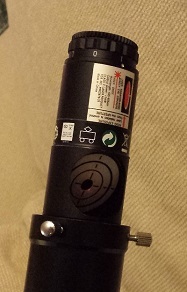 As for the Laser Collimator i have used it to collimate my SkyWatcher 200P and i was surprised how easy it was to use and overall i am really pleased with it. 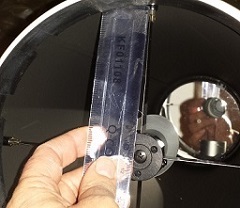 Below are the simple steps i took to collimate my scope. 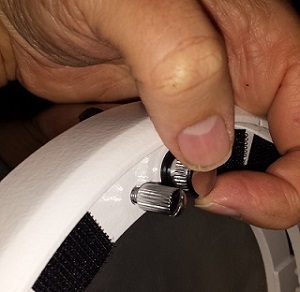 A few days after collimating my SkyWatcher 200p i decided to have another go just to get it as accurate as possible and to my surprise there was a daddy long legs spider living in the scope, i reached in and removed him and his web. Because of this i decided to bag up the scope so nothing more could get in it. As you can see below i used two bags and a loose bungee. 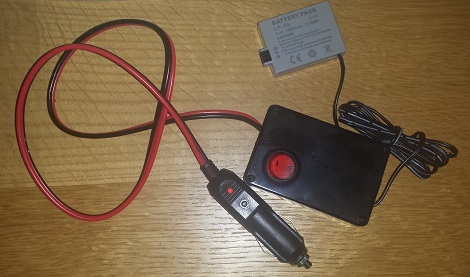 After the minor battery issues i had earlier in the month i decided to build a 12v EOS DC power supply thus giving me the ability to take longer exposures. 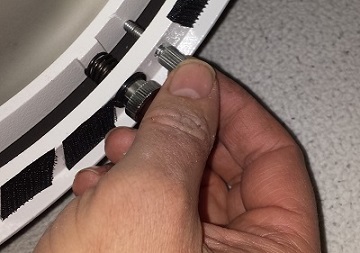 I have written a comprehensive how-to in the Projects/Mods section of my site, check it out and give it a try. Sadly that was it for the month as there had been cloud cover or rain, fingers crossed for next month!